Recently on the Facebook CTF page, someone mentioned a new dairy-free cheese on the market that melts and strings like real cheese. Since I’ve been working on developing a variety of pizza crusts, I decided to look into it. Daiya comes in two flavors- mozzarella and cheddar styles. They are both shredded. When I looked at their website, it said that both products are free of trans fats, dairy, soy, gluten, eggs, peanuts and tree nuts (excluding coconut). The site also says that the cheese products have no artificial ingredients, preservatives, hormones or antibiotics. As you can see by their ingredient lists, the products do contain some processed ingredients and high Omega-6 fats. Mozzarella-style shreds: Filtered water, tapioca and/or arrowroot flours, non-GMO expeller pressed canola and /or non-GMO expeller pressed safflower oil, coconut oil, pea protein, salt, vegan natural flavours, inactive yeast, vegetable glycerin, xanthan gum, citric acid (for flavor). Cheddar-style shreds: Filtered water, tapioca and/or arrowroot flours, non-GMO expeller pressed canola and /or non-GMO expeller pressed safflower oil, coconut oil, pea protein, salt, inactive yeast, vegan natural flavours, vegetable glycerin, xanthan gum, citric acid (for flavor), annatto. I was quite happy to see that both oils were marked as non-GMO, but I noticed the (presumably) corn-based citric acid was not. While canola and safflower are not considered optimal fats, I consider an occasional home-made meal using mostly high quality ingredients to be far superior (and cheaper) to eating out where you can’t control the types of fat or the quality of any ingredients used. This is especially true if your restaurant choices are limited by food allergies or you live in an area that doesn’t have restaurants that focus on fresh, local, quality ingredients. I am dairy-free by choice because the kids are still loosing their sensitivity. My husband consumes both gluten and dairy. The four of us evaluated both flavors. For the cheddar, we sprinkled it on top of a hot taco salad. For the mozzarella, we melted it onto a pizza while baking. 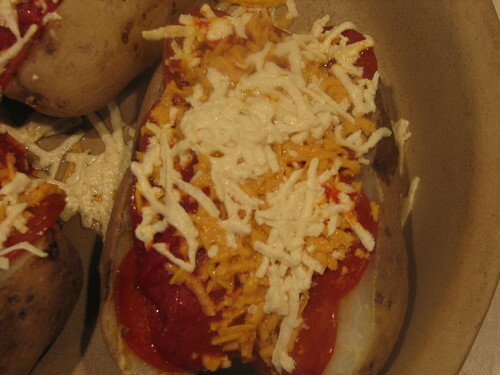 Then we did pizza potatoes with both flavors. Both melted quite well, but they did not melt to the point they totally melded into the surrounding cheese. This pizza potato was baked for 20 minutes at 400 degrees. You can see that the cheese melted somewhat, the mozzarella more so than the cheddar, but it did not completely meld into the surrounding shreds. I thought the flavor of the melted cheese was quite good, a very good non-dairy match for cheese. The cheese is not as tooth-some and substantial as dairy cheese. It does stretch, but not to the extent of dairy cheese. I think the chewiness of the final product might be a closer match to dairy cheese if the shreds were made thicker. It is definitely the best non-dairy cheese I have tried, in terms of meltability, chewiness and flavor. It is far superior to any other product I have tried. In the future, I will use Daiya cheese sparingly on occasion for the dishes we could normally use cheese. I think it is a good product to have in my arsenal, especially when we need something that feels like a treat and eating out is not possible. At our local Earth Fare, I paid $4.79 for an 8-ounce bag. While it does cost less than a quality, grass-fed cheese, we will use this sparingly on pizza in the future due to it having canola and safflower oil in the product. The cheese can be frozen. Disclaimer: I have not received any compensation for writing this review and I have no material connection to the brands, topics and/or products that are mentioned herein. The opinions expressed are solely those of my own family.